How Serious Are Dog Attacks on Letter Carriers? At Trantolo & Trantolo, we are dog lovers! Yet, we understand that lack of training and socialization can lead to serious incidents. According to 2017 injury statistics from the U.S. Postal Service, 6,244 employees were attacked by dogs while on the job. Believe it or not, these figures are not the Post Office’s highest. In 2016, letter carriers and other workers experienced 6,755 attacks – the greatest amount in roughly three decades. In response, the Post Office has developed better reporting and alerts concerning aggressive dogs. In extreme instances, a resident known to harbor a dangerous animal may have to pick up his or her mail from their town or local office. 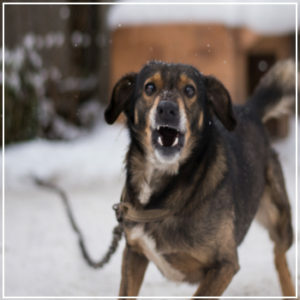 Even with more attention paid toward this issue, dog bites and aggressive behavior are serious business. What happens when you see a loose dog roaming a property? For a letter carrier or any outside party, the owner may claim, “He won’t bite.” However, underestimating aggressive behavior often leads to these incidents. Based on a report in the Washington Post, attacks against letter carriers and package handlers have been on the rise since 2013 – likely correlating with the promise of quick, on-time e-commerce deliveries. Tells its carriers not to run from dogs – this may lead to a chase – and to avoid eye contact with the animal. Instead, letter carriers are advised to back away slowly and place an object between themselves and the aggressive dog – for instance, a large mail bag. May stop dropping off mail if a dog continues to be a problem. In the most severe instances, such as an aggressive dog regularly roaming the neighborhood loose, multiple residents will not receive their mail. Instead, all parties may have to pick up their mail at the local Post Office. Recommends that owners keep their dogs indoors or behind a fence, or have the dog leashed whenever a letter carrier stops by. The Post Office launched its “Trip Hazards” app, which warns letter carriers of residences with hostile dogs. Information from this app then gets added to the Post Office’s database. Through its Package Pickup application, the Post Office started asking customers about the presence of dogs on their properties. Information sent through the app tells a driver when a property may have a loose dog roaming about. When the mail is getting cased every day, USPS employees may add warning cards that indicate which properties are home to dangerous, loose animals. In 2010, Eddie Lin, a letter carrier in Oceanside, Calif., was knocked to the ground after a Rottweiler charged at him. He died from blunt force trauma to the head. According to a report in the Worcester Telegram, dog attacks are common sources of ER visits. Attacks don’t always involve a dog bursting through a door. Rather, a letter carrier may be approached from behind when turning away from a house or dog. The dog doesn’t always need to be on the property a letter carrier is visiting. In one Delaware case, a German shepherd ran from a neighboring yard and mauled a letter carrier’s arms, legs and stomach. The wounds and subsequent cardiac arrest proved to be fatal. If the letter carrier regularly delivers packages to your front door, make sure your dog is in a separate room with the door closed. Because they can jump through screens and plate glass windows, dogs should be kept in a separate room with a secure door or on a leash. Keep the dog contained until the letter carrier leaves the neighborhood. It’s recommended that children and other family members not take mail directly from a letter carrier whenever the pet’s around. A dog may view this as a threatening gesture. Even if a homeowner claims a dog bite was an accident, he or she is still responsible for the injuries when an attack happens on the job. If you’re a letter carrier and have found yourself in this situation, it’s time to get Trantolo & Trantolo’s dog bite lawyers involved. To bring your claim to our attention, give us a call today.